Its grey, like gloomy grey here and though the house is quiet and I could should be getting some work done, I finally got the courage to post what I have been creating in my head for a while. There are notes spread on pages, with publishers listed and the prologue has been read...by one person, and she didn't throw it out...and now I bet you are all wondering which of my friends or family read it. I'll never tell. Its time to muster the courage and do what I have been wanting to do all my life. Write. Its not a new idea, in fact I am published on websites and even in a few magazines but when I initially sat down to write and began sending manuscripts to publishers. They were for children's books because I thought perhaps that was the easiest route. Truth be told some had a little interest but the denial letters filled my apartment mailbox in droves, enough that had I kept them I could probably wallpaper at least one room in my house with said letters. Who likes denial? No one. I especially hate being denied. For years I have spent my life being co-dependent, trying to make everyone happy and willing to move mountains for everyone else. I have had suggestions thrown at me about writing a book for years, about adoption, about finding your birth parents, about the "happily ever after" my life always seemed to take but honestly, I never felt it...until recently. My happily ever after is still in the works, and to be honest the person I am becoming isn't thanks to the ease of my childhood, the comfort of my early adulthood or even the beginnings of my parenting career when I was pretty sure that I knew how to parent effectively. As I began to read the closing chapters of "Girl Wash Your Face" Rachel Hollis spoke to me. In her chapter on marrying Matt Damon, she speaks to me, personally (okay, not really but I felt like she did) and as I closed the book, I hurried to pour a glass of wine, research those publishers and begin the prologue to something I do know. Its the something of learning the path you thought you were on may take a turn. Its the path of choosing happiness when the choice is easier to dwell in darkness. Its the path of living through and beginning to accept the journey of parenting one child with autism. I am no expert, truly. I am two years in and there are others more qualified, with better degrees and years of experience but I am honest (too honest sometimes) and I may be able to help one person, one mother or father who leaves an office their head spinning learning of a diagnosis that steals the child they carried and imagined and changes the path that they will walk walk forever. So I have decided, its time. Time to take a break from blogging so much, time to let the dishes go a little longer, let the laundry fluff one more time and time to take the time to write. 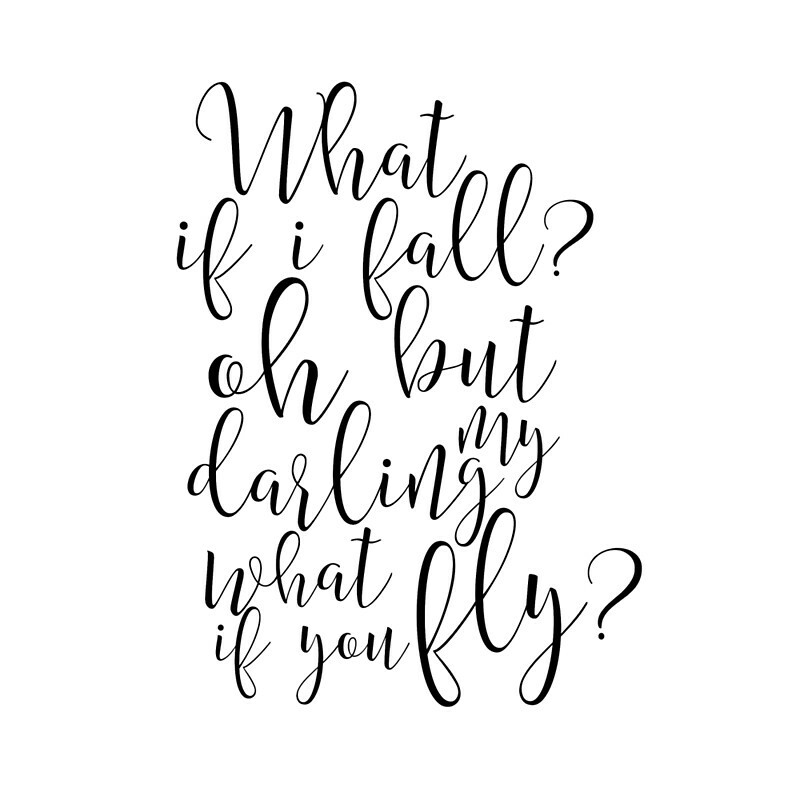 To really write because as I once found a quote from Erin Hanson that I frequently come back to "What if I Fall? 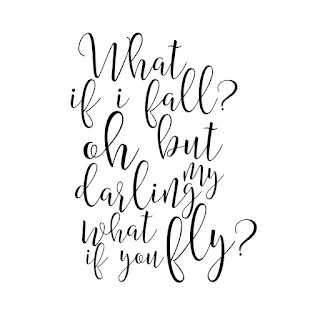 Oh but my darling, What if you Fly" and if this book ever gets somewhere, that my friends will be my next tattoo. Before I was a mother, I could only imagine what it was like. Then I was a mother and motherhood was more than I could have ever imagined. Before I was a special needs mother, I could only imagine what it was like. Then I was a special needs mother and it was more than I could have ever imagined. When you step into the shoes of a special needs mother, so much changes. Your life. Their life. The lives of your other children. Your relationships. Friendships. Daily interactions. Your beliefs. Your understandings. Your ability to understand others. Two years ago, I was a different mother. Certainly, any mom can say that but I might imagine I am the polar opposite of who I was before I heard those words two years ago yesterday. Autism Spectrum Disorder. I knew she was on the spectrum. I knew that autism was a part of her but I didn't know what doors that disability would slam in my face and what other windows would open for me to peer through with a new understanding, a new view and a new need to be the right person for this child who would need me for the rest of my life. I don't do it alone. I have other parents who have gone before me. I have other parents who walk beside me and though the years are passing, the days at times seem so long. I remember when my aunt told me to enjoy the early days because the days would fly by and life with littles would be so much easier than life with those big kids that moms of mini's often reach for excited to know who this little being will become. Each of these people, who have walked this journey with me, they are part of me and part of my Motherhood. From my first friends to those who I have just met, who have watched and witnessed, laughed and cried, you are part of my motherhood. It is so much more than the person we were when we first longed to have children or learned we were pregnant, no matter if it was planned or a surprise, that person is gone, today you are different. It is more than the gift of life from your womb and is often the gift of life of others children, of friends children of children you barely know. It is the chance to help a child up a slide, to witness a child learn to read, to teach a child how to ride a bike. Motherhood is learning to value each child in their own each unique way, even if they are not your own and not particularly a child you "get". Motherhood is acceptance. Acceptance of children. Of all children. It is pure, unadulterated want for success for children you know and those you don't. Motherhood is mourning the loss or disease that you learn about when it within your own life, your own family or even far beyond your community. Motherhood is the joy you feel when you see a child smile or hear a child laugh. Motherhood is nothing that I planned, the breezy afternoons that I once loved with a toddler napping in my open arms, the full dinners set on the table when my husband (finally) arrived home are long since gone but motherhood is better because it has called me and pushed me and pulled me to form to the person that I am supposed to be. My mother recalls my childhood dream to be a mother, and today, I am living that dream...it may be painted with different colors, even splattered with some grey or black but it is what I envisioned and it is the greatest gift I could ever imagine. To those who are mothers, physically, spiritually, through adoption, I salute you. To those who have laid their children to rest, have wept over unsuccessful pregnancies or never had the opportunity to carry, I salute you. Motherhood isn't just the act of mothering your own child. I believe each woman is a mother to someone, so today, women, I salute you for the innate gift you give to others. Love. Remember that movie, Charlotte's Web, if you watch the older cartoon version, read the book or even saw the newest version, that amazing Charlotte created a way, a way for Wilbur to remain alive and in doing so, she ended her life, doing all she could so he and her children could live. Perhaps, Charlotte felt like a mother. A person, willing to do all they can, give all they have so that their child(ren) can survive. Here I am, no eight legged spider able to weave a path for my child's success but still a mother willing to give it her all so that her child will find the path in life that will give her happiness. Like Wilbur, at times, I suffer with debilitating anxiety. That anxiety used to be over things that didn't matter like if someone liked me or thought highly of me but today, that anxiety is over my children, children with disabilities and honestly, the autism community and creating a path that children and adults with autism find success and a life that is what it is meant to be. Autism, it has its definition but I have my own. Autism is an all encompassing difference, not disability that draw the person and those who love the person in to create a will to want to make a life full of goodness and success for that person. Certainly, there are medical definitions and psychological ones as well but honestly as a mom, this is MY definition. Autism is also the greatest tool to create humility. Humility, synonymous with modesty is a trait that I never had, even in my days of lowest self esteem, yet here I sit, the mom of 5, who has reached all her "personal goals" and I am humbled by the care, concern and the gift that it is to be given this child with needs that I cannot meet without calling on those around me. I feel inadequate at times but at other times I feel blessed to be given the chance to live a life that includes raising a child who has a host of disabilities including autism. Today I sat on the computer for hours. I spent the day applying for DDD. I spent over an hour on the phone with PerformCare trying to understand the potential for help and realized that this, the autism, the disability, the need, is greater than anything I can give her. This is something I never planned. As I told the intake coordinator, I did what was "supposed to be done". This wasn't supposed to be my cross to bare but here I sit trying to figure out how to make our lives work, with autism with as little impact as possible on the other children in the family and today, I realize, its not possible. This isn't my cross, but hers and with me she has support in carrying it. In her siblings she has individuals walking by her side and in spreading knowledge and seeking understanding she and her friends with ASD have a society that will learn to love them for the gifts and talents they have with hopes of minimizing bullying, suicide attempts and despair in the future. Autism impacts us all. If it hasn't touched you yet, it will. The newest numbers in New Jersey alone are 1:34. Let that sink in, and one day, those kids, the 1:34 will reach adulthood and be disabled or need jobs and will we have given them what they need to find success in life? In living? To be capable individuals in society? In two years, autism has brought me to my knees in many ways. Yes, to pray, yes, to cry, yes, to crumble but yes, to know that I was chosen along with other Warrior moms to be the voice for tomorrows generation. In two years, autism has humbled me in ways I never expected or anticipated. As I told my children today, wiping tears from my eyes, I wouldn't change what autism has given me and who it has changed me to be but I would take it from my child in an instant. Today I realized I made yet another step forward on this journey, accepting humility, learning to be humble and seeking to speak up for those who cannot emotionally or physically because this journey, though I walk it, like Wilbur, I do not walk it alone. I ask you, have you learned? Has autism taught you? What key word signifies what it has given you in knowing someone or raising someone or loving someone with a disability? When my daughter was first being diagnosed with autism spectrum disorder, she also had a host of diagnosis' tagged on to her paperwork. As I stared at them, her diagnosis of sensory processing disorder jumped out at me and instantly. I realized that so much of her response to life was being fueled by her need for sensory input. Autism is such a vast spectrum I love when I hear the comment, "if you have met one autistic person, you have met one autistic person". Though there are some similarities between different people, it is the same as you would find in anyone else you may meet, you may share likes and you have have similar likes but you will ultimately be your own unique self. Each child or adult with autism is no different than any other person, they are uniquely their own with amazing gifts and talents. Sometimes however their needs impact them in a way that makes it difficult for an outsider to learn to love and cherish their entire being and this is where sensory needs come in for my daughter. I can recall my daughter nursing, lovingly tangling her sweet little fingers in my long hair and at that time I thought the sweetness was truly a blessing and it is. She loves to feel. She needs to feel. She needs input. Always. Shortly after that sweet stage, she began to pull my hair and a few inches came off and ponytails were constantly in. Fast forward and I realize those early moments were actually sensory seeking moments that she wanted to use to fulfill her need for closeness and input. Today, I look back and realize what this journey has taught me and is teaching me. Soon after her official diagnosis, I searched and found weighted blankets. I fell in love with Sensory Goods and in time realized that this little love needing input at all times. I was grateful our school had its own squeeze machine and wasn't surprised when I learned she LOVED to pass through those colorful mats and feel deep pressure. I watched as her OT at her former therapy center used "manicures" and "pedicures" to build a relationship and began to see that my daughter not only functioned better when she had her sensory needs met, she was able to control herself in a way that she couldn't without input. The team that my daughter currently has in place works well together and we are able to bounce ideas off each other to give her the best chance at success (though I really want more ABA--that is in old blogs though). Last week one of her special teammates and I were discussing her need for input and she mentioned that she sees that her oral need are often more pronounced but I also realized that she has visual and tactile needs as well, so I put together what I consider to be a great little "grab and go" kit that one can carry with them. The items I purchased are all found easily online and come in multi packs so I made a few "grab and go" kits to have on hand in the car, at school and at home. I find these to be good for kiddos as they are in the car. They do come apart and *usually* snap back together. I was them on the top rack of the dishwasher and they have a coating that makes them easier to bite as well. They are easy to carry in a purse or pocket. I also like that they don't scream "special needs" and can fit in small and large hands. For those not aware there is a "brushing protocol" initially introduced by an occupational therapist. The Wilbarger Protocol is sometimes used with children who have sensory needs. While we used the protocol for a while, Serphina will now use the brush herself to give herself input and will ask us to "rub her back" with the brush. Yes, sometimes I do even catch her putting them in her mouth. These are inexpensive and like the tangle toys fit easily anywhere. These easily cleaned coils are great for little ones to use in their hands or wear on their wrists. I find when children like my daughter their hands get busy doing things that can unintentionally hurt themselves or others. Years ago I knew someone who snapped rubber band on his wrist while at athletic practice. I have seen my own child use this bracelet in this manner not even knowing that was a "thing". They don't "spring" so the soft coil gently retracts onto the child's wrist. These are not meant for chewing though but can be pulled, twisted or worn during the entire day. We all remember those wands we had as children and we also remember their glue getting unglued and dripping water all over us. These wands, created by Toysmith are the "new age" product that allows children to visually calm and keep collected while watching the glitter float around. We have also found our daughter enjoys using these toys to "magically" change her siblings into animal and creatures from far off lands. Though my little one is diagnosed with a host of disabilities I have seen many a chewed pencil tops. These Subang Toppers are FDA approved silicone pencil toppers that allow children to chew during difficult moments when they are stressed or overwhelmed. They can be used by both children with special needs and typical children and come in fun bright colors and perhaps if you have enough you can play a quick game of chess. Finally, the Chewy of all Chewys, the one that was given to my daughter by her OT, "Chewy Tubes". This is where the "prideful" mom comes in. I often worry because of my child's behaviors she will be ostracized or stereotyped so these tubes, while her favorite are my least favorite. They scream "OT" to me, and though its needed, my fear of her not being accepted creeps in, however this tube was giving to her once early intervention OT and she still loves it today. They are latex free, non flavored and non-toxic and meant for chewing. Often if given a chance, she will pick this over anything....it only becomes a problem when I can't find it. As I walk this journey I learn more and more each day. I watch as my daughter chooses one thing and then dislikes it a week later. I know she, like my other children is ever changing and ever evolving. What do your children seem to be drawn to? Are they seekers or avoiders? No matter what they are, they are perfect, and we need to continue to work to give them the best chance they can have at success.